Silver Anniversary – as good as Gold! A boiling atmosphere, a capacity crowd, standing applause proved us right. 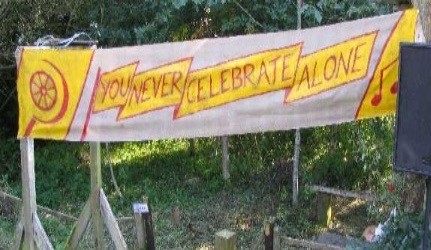 After last year’s unbelievable performance with the audience “over the moon” we bent backwards to feature Berlin’s no. 1 singer, accordionist and performer again. Not an easy task, given the fact that the musical powerhouse hits around 4 stages per week – every week! But she is doing it one more time: 2000 kilometres (one way) for just one gig on the small stage under the oak trees! 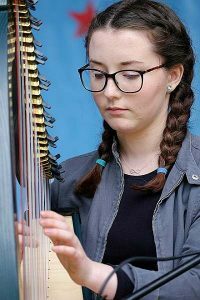 16 years old and as cool as you like, Dungiven’s rising star on the Irish Harp will fusion with Isa but beyond doubt put her own stamp-mark on the performance as well. Her traditional style of playing was described (in Germany) as “the music of angles”. Neither she nor Isabel might be angles – their music will make “gold drip from the heavens” – that’s one of the great facts the Yard – Fest creates! Based in Ballymena / County Antrim, she has often been described as the best player of the “musical saw” on this island. She will take the stage and let us tell you: The energy she releases will take you in storm! It has been a long time coming – great to have her at the 25th! Aileen Mc Intyre and Liam Burke were born, bred (and still live) in the neighbouring townland of Gortnahey (where Willie Drennan once saw a head sticking out of the pavement on the road….). The fact that the highly talented pair never appeared at a Yard – Fest is not logic or explainable – it just never happened. You will love them, we know! They tell us they will only perform “two or three songs” – the audience at our gathering knows well how that can be changed! Another new kid on the block (or on the stage) is the incredible David Mc Clean! The price-winning photographer, recording engineer and film – maker is the same person as the powerful rock-guitarist with a strong blues – leaning. After filming Willie Drennan for a particular project, David went obsessed with the idea of accompanying “the big lady from Lambeg” with his blues guitar. 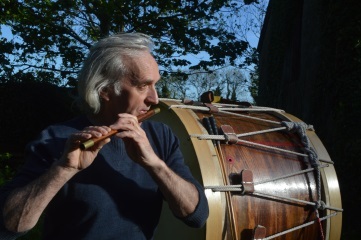 Can you imagine: Willie Drennan in “dervish – dance – mode” with the Lambeg drum – the instrument playing the melody is not a flute but an electric guitar! You can’t??? Come to the 25th Yard – Fest and experience this World Premiere! When we say “no borders – no limits” we mean that! + Poetry with a performance – edge by Bernard Davis (Birmingham). + Comperes: Hermann Glaser – Baur + one surprise – guest. + Straight after the gig: Ireland’s best session in the gas – lit barn! Liam and Aileen (vocals, acoustic guitars) will have no problem “warming up” the best and warmest audience in the world! 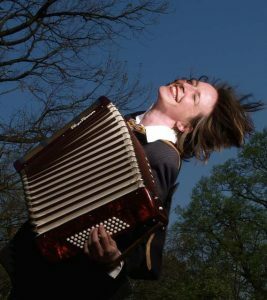 Isabel Neuenfeldt (accordion, vocals) straight from Berlin with a new programme especially for the 25th Yard – Fest. She will meet Dearbhla Mc Taggart (Irish harp) in a unique fusion. This set alone certainly makes the concert worth any music-lover’s while! Meets live on stage Diane Wilson (musical saw), David Mc Clean (vocals, guitars) and who else the master of fusion might magic out of his cap! World premiere on stage: The Lambeg Boogie! Prepare yourself for the hottest set ever in 25 years. Ireland’s best session starts directly after the concert in the gas – lit barn. If you miss the session you have missed the Yard – Fest! glorious dinner, cooked under the eyes of our visitors by the Berlin-catering-brigade! Vegetables from our own gardens, Vegan and Vegetarian options available! German “drop of the pure” (hops, barley and water only, by law! ), locally roasted coffee, Belfast – tea, treats galore…. The best people from beyond many borders – friends only, no strangers here. As the Open Day, the Yard – Fest is a private event, from 6 pm by invitation only. The owner reserves the right to refuse admission at any time. This programme as well as the full Open – Day one and our flyer for the Fashion Show are available in hard – copy version, just give us a ring and we will send you ones. Next PostNext Open Day Programme 2018 – Last Minute News!